Dmitry Rogozin proposed that all major Russian aircraft brands should be revived as part of new development strategy to conquer lost markets. The Russian aircraft industry must implement a new development strategy to conquer lost markets, Deputy Prime Minister Dmitry Rogozin said Wednesday. “Despite all efforts, the Russian civil aviation market has been lost to a great extent by our manufacturers,” Rogozin, who is responsible for the defence and aerospace industries, said at a government meeting to discuss the situation in the civil and military aircraft industries. “The situation is unacceptable, so whether you agree or not, we must develop a strategy of new re-conquest,” he said, noting that up to 80 percent of all civil aircraft on Russian domestic flights are foreign-made. According to company data, Aeroflot and Transaero, Russia’s two leading airlines, fly mostly Boeing and Airbus planes, with just a handful of Russian-made Ilyushin Il-96-300, Tupolev Tu-214, and Sukhoi Superjet 100-95 aircraft in service. Rogozin proposed that all major Russian aircraft brands should be revived as part of the new strategy. “These are such national drivers as Tupolev, Sukhoi, MiG, Yakovlev and other well-known brands, which for some inexplicable reasons have been pushed almost into oblivion…,” he said. 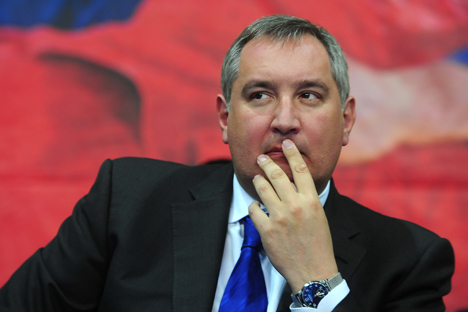 Rogozin also proposed setting up a consultative body similar to the Russian government's Marine Board to regulate relations between the aviation industry and its customers. Russia has produced only one totally new passenger plane since the collapse of the Soviet Union, the Sukhoi Superjet 100 regional airliner. United Aircraft Corporation, the holding which incorporates the myriad elements of the Russian fixed-wing aircraft industry, is due to begin production of the MC-21 (formerly known as the MS-21) mid-range airliner in 2017, according to Russia's Rostech holding, UAC's parent company. Aeroflot will be launch customer for the aircraft, with 50 on order. The Russian civil aircraft industry faces massive competition from Airbus and Boeing, which have received orders for 734 and 692 airliners each so far this year, the Guardian reported last month. China has also announced it intends to start producing its own airliner, the Comac C919, which will compete head-on with the MC-21. Russia currently produces no light aircraft, but at last month's Paris air show, Rostech announced a tie-up with Austria's Diamond Aircraft to start production of a new 19-seat utility plane intended for local air services in Russia.